NC Medicaid MCOs: You Cannot Prove a Negative! In philosophy, you learn about “evidence of absence.” It’s kind of like a logical assumption based on the LACK of evidence. Such as: P implies Q is false, but Q is false, therefore P is false. Or Knicole takes a break from blogging on the weekends. Knicole did not blog today, therefore it must be a weekend. There is also some who say you cannot prove a negative. You cannot prove that flying reindeer do not exist; it is up to the flying reindeer to prove they do exist. Personally, I think this way of thinking is pessimistic and leaves little room for faith. But, in some circumstances, such as…how are my tax dollars being used for Medicaid recipients, I do not want a non-proven negative. I want proof. The point of the article was the drastic decrease in behavioral health service authorizations within MeckLINK’s catchment area (Mecklenburg county) for Medicaid services since MeckLINK went live. If this graph is correct, MeckLINK has some serious questions to answer to taxpayers. Within 4 months, the number of mental health Medicaid consumers in Mecklenburg county decreased OVER HALF??!!! From 1,518 to 689! Did the 829 people, who were receiving mental health services back in February/March 2013, move from Mecklenburg county/die/heal (in order to not need the mental health services in June)? Or has MeckLINK (and other MCOs) simply begun to deny medically necessary mental health services??? If it is the latter and not the former, I ask, as a taxpayer, where did my Medicaid tax dollars go? To MeckLINK salaries? And, if it is the latter and not the former, as a person concerned with mental services, especially for Medicaid recipients, I ask, what has happened to the 829 Medicaid recipients no longer receiving mental health services?? Hospitalization? Incarceration? Homelessness? Or just sitting at home depressed…unable to function as they could when they did receive services? Well, Ben Bradford, of WFAE, asked MeckLINK’s chief financial officer, Ken O’Neil, this question. O’Neil’s answer? The evidence of absence. O’Neil revealed that MeckLINK is on tenuous financial footing. It ran a deficit in May and June at a rate that would put it out of business in less than a year. He also argues those deficits are proof that MeckLINK isn’t sacrificing care for profit. O’Neil argues that MeckLINK’s deficits are proof that MeckLINK is not sacrificing care for profit. Proof that flying reindeer do not exist! O’Neil contends that MeckLINK’s deficit proves that MeckLINK is not denying medically necessary services to mentally ill Medicaid recipients. BTW: O’Neil contends this non-proven negative despite the graph showing that more than half of recipients in Mecklenburg county are no longer receiving services. O’Neil’s contention (that a deficit proves MeckLINK is not sacrificing care for profit) has a gaping, logistic flaw. I estimated (and probably underestimated) that CenterPoint, by paying for its employees and employees’ families’ health premiums, was spending approximately $1.5 million in health care premiums…money that should have gone to Medicaid recipients. So MeckLINK’s (O’Neil’s) contention that MeckLINK’s deficits are proof that MeckLINK is not sacrificing care for profit is flawed. Where is the proof that MeckLINK is not over-paying its top executives? Where is the proof that MeckLINK is not over-spending on its employees, i.e., paying for employees’ health care premiums…as well as the families of employees? Well, I found a few graphs published by DMA that caused me more reason to believe that O’Neil’s “proof of a negative” is flawed. 1. Behavioral health related claims (e.g., Inpt MH, ICF/MR, CAP-MR and non-physician practitioners) continue to decline with the implementation of BH MCOs. Please note that several of the BH-related types of service have volatile costs per service unit and service units per recipient. This is a consequence of the drastic drop in utilization due to the implementation of MCOs and does not reflect a widespread trend. We will likely remove several of these types of service from the report soon. I have SO many issues with this “trend.” Such as: “Continue to decline.” “With the implementation of BH (behavioral health) MCOs.” “Drastic drop in utilization.” “Due to the implementation of BH MCOS.” “Not reflect a widespread?? ?” (Aren’t the MCOs statewide?). “We will…remove?… several of these services from the report”….WHY? We don’t want to track the fact that the mentally ill are not receiving Medicaid services? The DMA Dashboard Report also depicts numerous graphs. Many of the graphs depict last fiscal years’ Medicaid services’ dollars spent (with a blue line) and this years’ Medicaid services’ dollars spent (with the red line). Most years, both last fiscal year and this fiscal year, are fairly similar. Notice the interplay between the red and blue lines. 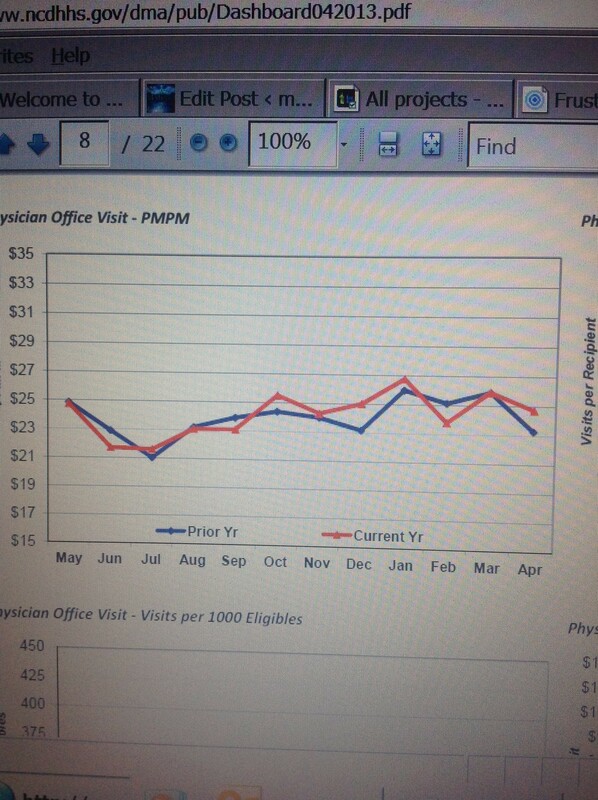 The expenditures for physicians’ office visits from last fiscal year to this fiscal year is, relatively, similar. The blue line depicts last fiscal year. The red line depicts the current fiscal year. The left side of the graph shows dollars, while the bottom side shows months. As you can see, the blue line (last fiscal year) shows a semi-constant, horizontal line with a small down tick in April 2012. The red line, however, (this fiscal year) begins where the blue line left off, but, then, in January-ish 2013, a massive decrease in dollars spent. So….a massive decrease….surely the MCOs were not paid the same…oh, and surely not more!!!??? 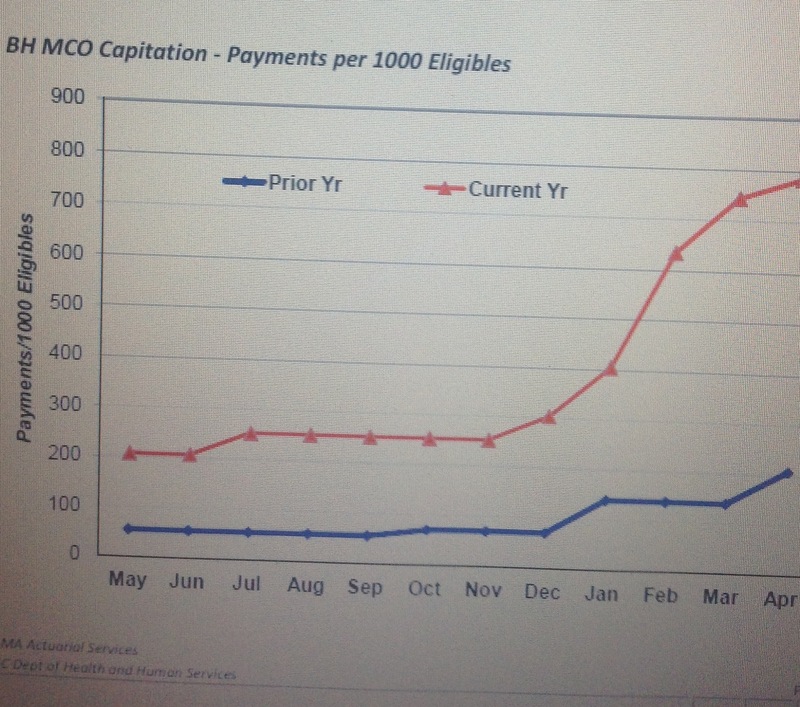 Now, mind you, I am no math expert, but this chart, to me, appears to show a 700% plus uptick in MCO capitation payments. So, according to O’Neil, MeckLINK is running at a deficit, at least for a couple of months. 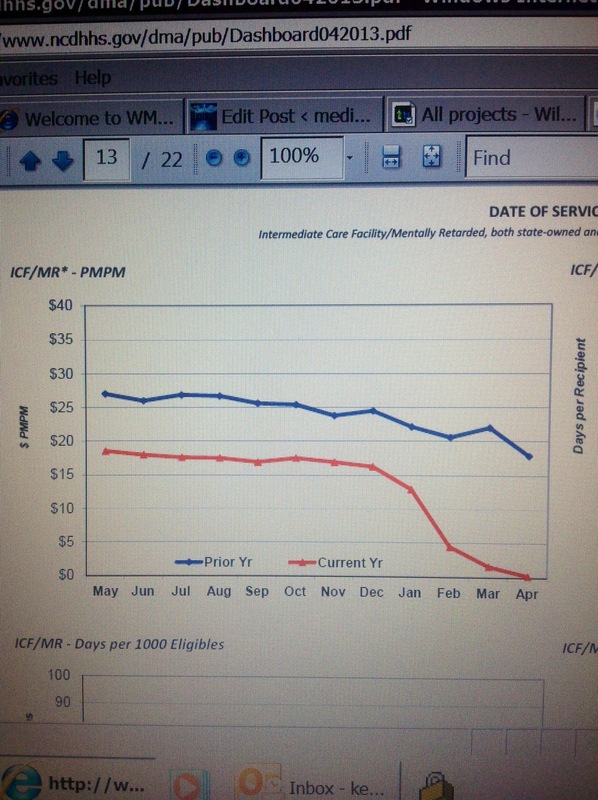 Yet, DMA’s graphs demonstrate a decrease in mental health services and an increase in payments to MCOs. The fact that Knicole did not blog today proves that it is a weekend. (Surely, Knicole was not just too busy on a weekday to get out a blog). MeckLINK’s deficits are proof that MeckLINK is not sacrificing care for profit. (Surely, MeckLINK did not pay hefty salaries to top executives or all health care premiums for employees and families). You cannot prove a negative. But you CAN show proof. Posted on August 13, 2013, in Alliance, Behavioral health, CenterPoint, Denials of Medicaid Services, Division of Medical Assistance, ECBH, Health Care Providers and Services, MCO, MeckLINK, Medicaid, Medicaid Contracts, Medicaid Recipients, Medicaid Services, Mental Health, Mental Health Problems, Mental Illness, NC DHHS, North Carolina, Provider Medicaid Contracts, Tax Dollars, Taxes, Taxpayers and tagged Behavioral health, Decrease of Mental Health Services, denial of medicaid services, Division of Medical Assistance, DMA, DMA Dashboard Reprt, Health care provider, Ken O'Neil, Managed care, Managed Care Organizations, MCO, MCO Profits, MeckLINK, Medicaid, Medicaid recipients, Medicaid Services, Medicaid Tax Dollars, Mental disorder, Mental health, NC DHHS, NC Medicaid, North Carolina, North Carolina Department of Health and Human Services. Bookmark the permalink. 8 Comments. 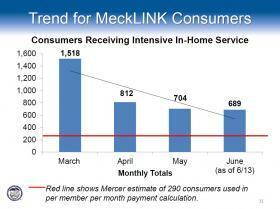 When you look at the Intensive In-Home graph it’s obvious that Mecklink is going to continue to deny services until they get down to the 290 consumer mark. So Intensive In-Home providers should prepare to face more cuts. Another goal of the waiver was to reduce the number of providers to create a smaller network of providers who are stronger financially. The cuts are going to continue. None of this is about consumers it’s all about money. This is absolutely crazy. I am not a BH provider but I am a tax paying citizen and am outraged. Who is holding MeckLINK responsible? BINGO! No one is holding MeckLINK accountable. To make matters worse, it is not just MeckLINK…it is all 11 MCOs across the state of North Carolina, which are all, most likely, misusing millions of tax payers’ monies for salaries and health care instead of the Medicaid recipients getting medically necessary services. Found this blog last week and have enjoyed all your posts, unfortunately the subject matter hits very close to home as I work for a mental health provider who is struggling to keep our doors open. We have jumped through so many hoops over the years and will continue to jump until we can not longer. We are here for the clients and it sickens me to see how many staff are employed at the MCOs as well as the salaries that they bring home. I think you are spot on…that is where Medicaid monies are going. Thanks, Jennifer! I wish your employer the best. I know many providers are suffering. Before allowing these MCOs to take over behavioral health, there should have been some sort of check in place to determine whether the Medicaid funds would be spent appropriately. Now Medicaid recipients and providers are suffering. Excellent analysis Knicole. I would add this…Given my experience providing billing services to providers throughout NC, there is a large unpaid backlog of valid claims for services rendered. This is also contributing to the appearance that the MCO system is managing expenses. Lastly, taxpayers should demand an accounting of the cost of administering the MCO system vs the old single payer system. The difference would likely be staggering. Doug, Thanks for your comments! I would definitely like to see an accounting.